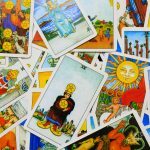 Did you know that is possible to associate Tarot cards with Zodiac signs? Yes, the 12 Sun signs can express their energy in the cards and vice versa. Find out now what Zodiac sign’s Tarot card you have. Our Sun sign represents our essence, the one that will guide us from the beginning until the end of our lives. Tarot cards are used as a guidance tool, so each Zodiac sign’s Tarot Card works as an expression of our vital energy where you can rely on when you need a north. See below all the Zodiac sign’s Tarot Cards. The element of this card is the fire, as well as Aries’ element. The Emperor expresses leadership and the ability to create his own destiny. What else they have in common is the strength. This card tells that Aries reunites all the qualities to start things and keep people motivated. Be aware that you can use your strength to do good as well as bad. This card is also known as The Pope. Although it represents a religious figure, its energy is not all turned into religion. The essence of this card is related to the counseling that hovers for and above Taurus. It is a reminder that you should always question yourself and see if your beliefs need an update or change. Many people think of love relationships when they see The Lovers card. But besides love encounters, this card also represents friendship and partnership. The lesson that this card teaches is that relationships can be easy to happen, but difficult to maintain. Communication is the key to the success of any kind of relationship and this is a quality that Gemini certainly possesses. While Cancer prioritizes the safety of owning a solid home, there is an intimal desire of freedom, even if it is small. The Chariot represents the possibility of moving and conquering more space apart from home. This card reminds that you can remain safe and transport your nourishing soul wherever you go. When we think of strength, we immediately relate to physical strength. The Strength tells that besides our physical body, we must develop mental and emotional strength. Leo is an active sign and has what is needed to achieve many things in life in a positive way. The lesson for Leo is to learn how to trust your own intuition and build an unshakable fortress inside you. The Hermit card connects to one of the best qualities of Virgo: wisdom. Wisdom is not only to have answers for all the questions but to know when to leave in order to reflect on things. Intelligence, analytical capacity and introspection build the essence of The Hermit. This is a reminder that you can learn a lot if you refugee in your solitary nature once in a while. The element of this card is the air, as well as Libra’s. What else they have in common is the representation of doing what is right to anyone. Libra has the natural ability of diplomacy, trying to transform all the places in a pleasant space. The Justice is a reminder that in order to put all these benefits in practice, you must find your inner balance first though. When people see The Death card, they often get scared. You can relax because death here relates to change. Something needs to die in order to become something better. Scorpio is the sign with the ability not only to see it but to accept this fact. To access your deepest thoughts and the emotional comprehension are qualities that connect Scorpio to the Death. Sagittarius is the sign that always wants more, after all is a symbol of expansion. The Temperance card comes to show that although there are more to see and learn, you must know when it is time for a pit stop. This card reminds that you should practice patience, a virtue that is nothing like Sagittarius. Keep calm, the figure of The Devil not only represents what is evil. In this case, The Devil card appears to remind you that you should follow your heart and do what you truly desire. Capricorn often forgets the personal desires to put more effort on work, for example. You should not be imprudent (and we know that Capricorn never is) but you are allowed to put more fun in your life. The Star works as a lighthouse where you can trust the light to keep pursuing your goals. The Moon is the card that associates to Pisces by psychic questions. This card represents the night, the sleep and everything related to this underworld. Pisces is a very intuitive and feminine sign, which is perfect compared to the energy of The Moon card. This is a reminder that you are allowed (and should always) to rely on your imagination to achieve what you want.